Greetings from the Presslabs development team! We have listened to your feedback and requests and we are pleased to announce a new set of features built on top of a massive refactoring of our Oxygen dashboard. Just to get an idea on the work behind the release, we changed approximately 200 files, made 10,000 additions, made 4,500 deletions in 500 commits. We’ve added an overview page with all your sites, containing the last 24 hours traffic data, with uptime information for both your public site and the wp-admin area. The data is provided by pingdom.com, aggregated every minute, which we were already using to monitor the uptime of our services on our public status page. Now adding a site in our system takes less than a minute if you are already registered in Oxygen. 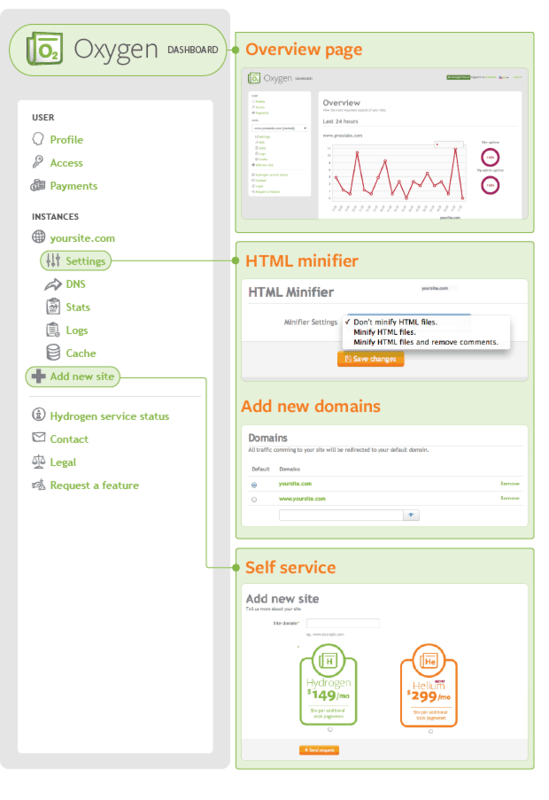 You can add a new site directly from the Oxygen dashboard, by simply entering your domain name. All other configurations such as CDN subdomain are set up by default, but you can review them anytime. The self-service goes further and now with a single click you can add a redirected domain to an existing site already hosted with us. And as your site performance is concerned, we’ve added a carefully tested HTML minification and comment stripping feature for delivering your content in the most efficient way. And our cherry on the pie is the crisper font and reviewed design coming hand in hand with a lightning-fast load time for every click.